Arizona is home to two Republican senators who have bucked the president on health care and immigration. It makes perfect sense that President Donald Trump is headed to Phoenix today. Trump may have only narrowly won the state in the 2016 election, but he visited Arizona, home to some of his most stalwart supporters, often when he was on the campaign trail. Former governor Jan Brewer, an early supporter of Trump’s, has defended him even after his most recent, and most disgraceful, stumbles. Just last week, Brewer told CNN that she “was not ashamed” by Trump’s defending white supremacists after the violence in Charlottesville. As if Trump’s comments following Charlottesville weren’t endorsement enough of white supremacists, Trump hinted last week that he may also pardon former Maricopa County sheriff Joe Arpaio. The disgraced sheriff was convicted in late July of criminal contempt after a years-long legal saga over his discriminatory policing tactics. 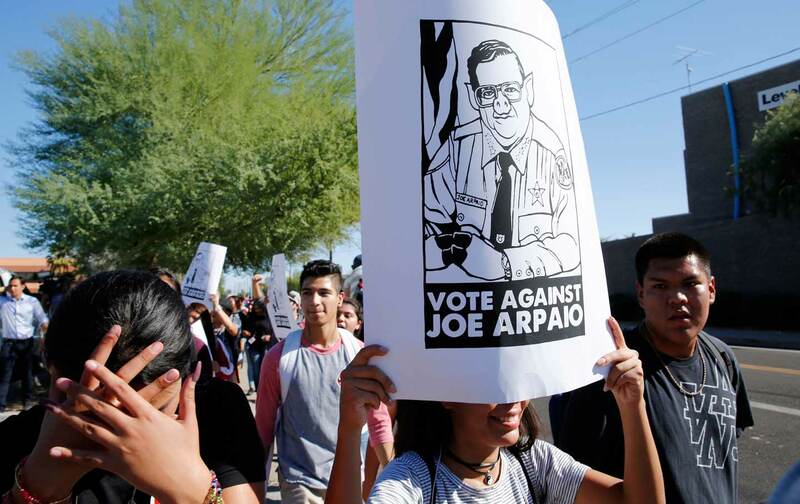 A federal judge found that Arpaio had ignored a court order to stop racially profiling Latinos. The two are political allies; Trump has borrowed heavily from Arpaio’s brash and openly racist approach to policing immigrant communities. And Arpaio lent Trump his hard-line anti-immigrant credibility, regularly appearing at Trump campaign events and speaking at the Republican National Convention last summer. Arpaio was ousted in the November elections after 23 years in office, but faces sentencing—and a potential six months in jail—in October. Coming a week after Trump offered his most unequivocal praise yet of the organized white supremacists who have backed him for the last two years, his floating the possibility of pardoning a flagrant racist seems altogether fitting. It would not only be Trump’s very first pardon, “this would be an official presidential endorsement of racism,” the ACLU’s deputy legal director, Cecilia Wang, said in a statement. But there are other reasons Trump may be drawn to the state. Arizona is also home to Senators John McCain and Jeff Flake. The two Republican senators have taken on the president’s efforts to repeal Obamacare and shut down legal immigration channels, respectively, and drawn criticism from Trump on Twitter. Flake has repeatedly criticized Trump, did not endorse the president or attend the RNC, and has just published a book decrying Trump’s divisive attempts at populism. Just this past weekend, Flake penned a New York Times op-ed that was a direct rebuke of Trump’s efforts to scale down immigration into the United States. Trump, in turn, has retaliated by turning to Twitter and all but endorsing Kelli Ward, a challenger of Flake’s, who’s up for reelection in 2018. There is no doubt that Trump will use the opportunity to hit again at Flake in the junior senator’s own territory. Phoenix is also the site of one of Trump’s landmark speeches on immigration, which he gave almost exactly a year ago. In it, he outlined a 10-point plan to target immigrant communities by casting immigrants as lawbreakers and criminals, defunding sanctuary cities, reviving police–immigration agency partnerships, and targeting gang members or those suspected of being in gangs. What’s striking is that, aside from the border wall, which was always his most offensive and most unrealistic idea, Trump has actually been able to translate his campaign talk into action. With the help of Attorney General Jeff Sessions, the Trump administration has been able to compel cities to reject sanctuary-city status by threatening to withhold federal money. The Trump administration has aggressively pursued gang members, or those suspected of belonging to gangs, in immigration sweeps. And in Trump’s first few months in office, immigration arrests jumped 40 percent over the previous year. Pardon or not, and in Phoenix or elsewhere, inflaming emotions and dividing the nation seems to be Trump’s most explicit intent at all times.